Let’s get some holiday crafting STARTED!! 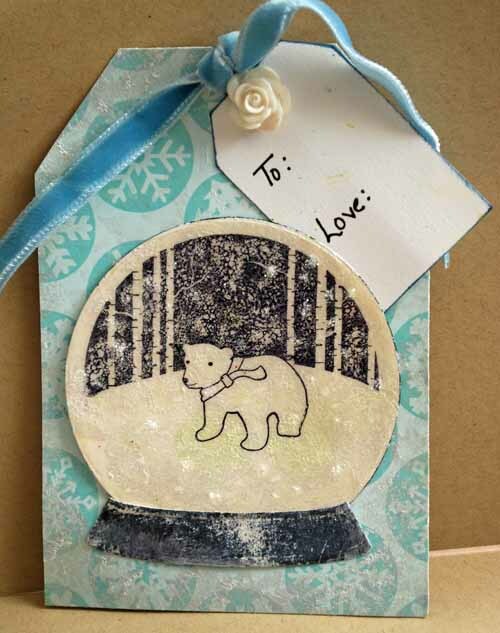 While at Stampers Corner last weekend teaching I fell in love with the Polar Bear stamps + the snow globe die cut from Memory Box. I’ve been a fan of the company for a long time, and I couldn’t say no to them… even with my long history of not actually using adorable animal stamps. I’m determined though – and here’s my first project with them. enabler note: simonsaysstamp.com has the snow globes (there are a few sizes!) 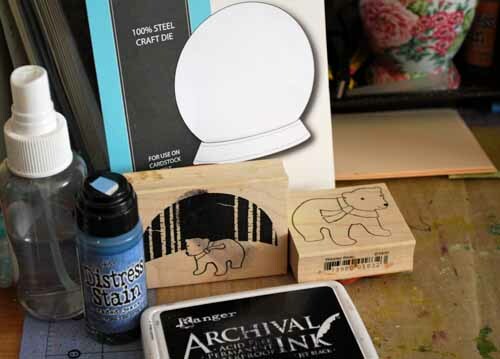 + the polar bear stamps in stock! 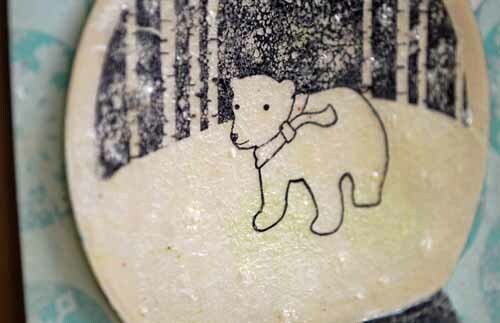 After I die cut the snow globe pieces onto manila paper I used pearl dabber paint on the circle, then once dry stamped with black archival ink. The result was a “textured” look to the stamped image. LOVE! The base is stamped with black archival ink lightly – so it’s not even and has an aged look. LOVE how the paint adds that texture! Then how the glossy accents on top adds, well, glossiness! Also? Applying distress stickles before glossy accents is dry = great subtle “snowflakes” in my globe. So fun. To finish it I just threw on a little tag (edged in ink) and topped with a brad + ribbon. 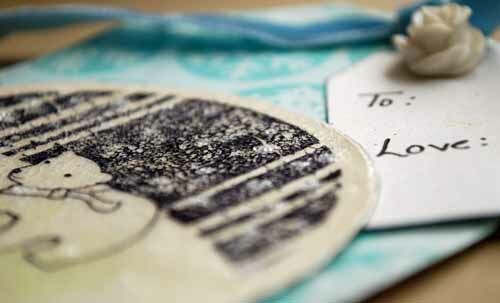 Which gift gets this tag? AND… what will I make with this die cut next? I am just starting to warm up – and I’m loving every minute. Really sweet. Perfect to have hanging in the kitchen when it’s 100 degrees outside. What a great tag. I love that snow globe!! adorable tag! I love that memory box polar bear. ooooh! i had to sign right up for that class at BPC! looks like so much fun! that tag is so great! Oh How cute is that snow globe?! Thanks MAy for sharing, going to have to get this! That is just adorable May! I don’t even know where to start with this one! It’s YUMMMMMY and beautiful! You rocked that one out! I’m so inspired by your 25 days…great posts!